2.1.2 2 Choose a sub-race. The following paths represent various spiritual options available to all ponies. While all ponies share the brand of destiny, which guides them towards their greater purpose, only a select few have truly potent destinies. Like the chaos hunters, anteans are blessed, or cursed, with an overwhelming fate. Unlike the hunters, the nature of an Antean is near impossible to hide, as they are large, towering over their fellow ponies ranging from 14 to 16 feet in length. Such ponies are compelled to protect their smaller kin, but their stature makes staying in small pony towns a challenge, driving many off to watch from a distance. Their size has given rise to wild tales of rampaging giant ponies that can demolish settlements on an angry whim and enjoy the taste of innocent ponies. However, they are individuals, equally capable of good or evil. Most are gentle giants, who wish to use their stature and might for the greater good of the society, even if only to show off. It is said there is a full and proper city of these giants, but its location is as hidden as its name. Those few anteans that speak of it reference their queen, who no normal sized pony has ever seen, and clan leaders for clans no one recognizes. Some claim that the anteans are making up a story to feel more involved than the awkward giants in a small world they are. Antean ponies were most common before the empire. Though the Queen bore no ill will toward her oversized subjects, they dwindled in number without explanation. Perhaps the vital power that fueled their girth was waning or it was simply not the right time for these great ponies. Only time will tell if the anteans will make a resurgence. Ability Score Increase: Your Strength score increases by 1. Speed: Your base walking speed becomes 30. This replaces your base pony speed and your sub-race speed adjustment to walking speed. Stout: Anteans are larger than most ponies by several hands. You count as one size larger when determining your carrying capacity and the weight you can push, drag, or lift. Big: You are large and use that size to your advantage. You have advantage with strength ability checks and saving throws. Your brand of destiny has marked you for the battle against the forces of chaos. You rise to the occasion, seeking out minions of chaos to defeat and safeguard society. Your kind was rare even during the height of the pony civilization. Your birth was likely celebrated and you were brought up on stories of valorous battles and epic deeds. It’s a large horseshoe to fill, but, maybe, you’re up for it. It is said that the first chaos hunter was a young pony that suffered great tragedy at the hands of the forces of chaos. The sheer mindlessness of it, that those who took away all he had did not even know or care for his loss, drove him to forsake his original destiny and devote himself to hunting the enemies of order. Like the first, the brand of destiny of those that follow hint at what their destiny might have been, had they not been chosen for the task. While only the first is told to have become a chaos hunter after birth, it remains a faint possibility. During the height of the empire, the Queen called that such crusaders were to be honored and assisted as a pony could, calling them protectors of the empire. Religiously, chaos hunters can follow the god of their choosing, provided they are not chaotic. Most pay heed to the Sun Queen and the Moon Princess to light their way during the day and warn them of chaos at night. It is said the Sun Queen weeps quiet tears for the chaos hunters, lamenting that any of her children would have to sacrifice the possibility of peace for a lifetime of vengeance and war. Enemy of Chaos: You gain the ability to protect a target from chaotic fiends, as per the Protection from Evil and Good spell, as an action. You regain use of this ability when you finish a long rest. Long ago, a group of ponies no one now remembers, wielding powerful magics and even larger egos, attempted to defy the order of nature and rewrite the world in their image. They thought to mandate the gods and brought the wrath of the divine down on themselves. When the smoke cleared, their leader had been killed outright for their folly. But, while dying, she had woven one last enchantment to protect her fellows. Their bodies had been altered along with their destinies. One and all, their brand had become a metallic gear emblazoned on equally metal hides. Their insides clicked and whirred softly, betraying their new mechanical nature. Though they yet lived, they were machines. Their salvation was as much a curse. Though psychologically still ponies, and able to form romantic liaisons with other ponies, clockwork soon discovered that all interbreeding was impossible. Clockwork appeared, to their horror, to be a new separate species. It wasn’t until the longest day of the following year that the Sun Queen granted them a reprieve. For that day, should they spend the hour at dawn and the hour at sunset singing Her praises, the clockwork would be made flesh again, and could foal once again with their beloved, whatever the race. Still, all ponies conceived would carry their parents’ curse forward, born clockwork. Despite being comprised of gears and springs, clockwork do grow, age, and die like other ponies. Over time, old parts fall free and new parts grow into their place. It is considered taboo to sell one’s old parts, but they do make for sentimental gifts to friends and family, especially when worked into something larger. The largest example of this is the clocktower of Bit n’ Bolt, fabricated over decades by one pony using his own parts until the monument to his beloved city was complete. Their brand of destiny always features a gear, but does not always appear on the flank. All of the physical tribes of pony can appear as clockwork. Earth-bound clockwork with great piston driven legs, pegasi with beautiful wings of stained glass and crystal, and unicorns with delicately filigreed horns. Their intricate appearance once earned them favor with the Queen, when a dancing earth-bound clockwork became one of her court performers, charming the Queen and court in attendance. Clockwork Traits: You have advantage against effects that confer the charmed, exhaustion, and poisoned conditions, as well as against any disease effects. You are also resistant to poison damage. You are not subject to spells that restore life to the dead. Tenacity of Gears: You do not need to sleep, eat, or breathe but can still do so to gain their benefits (such as drinking potions). Where others see a pony, the truth lurks beneath the flesh. Pony society plays unwitting host to a discrete set of shapeshifters, yourself among them. You draw small amounts of energy from others by proximity, though perhaps different motivations draw you to adventuring. Though doppelgangers tend more towards selfish alignments, individuals can seek greater things, despite their origin. Ability Score Increase: Your Charisma score is increased by 1. Disguise Adept: You are proficient with a disguise kit and can disguise yourself without a disguise kit. If you use a disguise kit, the check is made with advantage. Fast Talker: You gain proficiency in either the deception or persuasion skill. Your pelt glimmers, even in the dimmest light. You are tied to earthen elements and appear to be made of gemstones as much as fur and flesh. Old stories tell of a kingdom of your kind, which was once a source of hope and radiance. Your kingdom came to be before the Queen and her empire took hold in the world. The Kingdom of Crystals stood as a gleaming jewel scant miles north from where Blevik would later be founded. Very progressive for its time, it welcomed ponies of many tribes within its solid walls. Also advanced were its laws, which were comprehensive and, in the eyes of its people, just. Ponies were judged by their accomplishment and strength of character, as opposed to their tribe. It is said that the crystalline pelt that characterizes the modern day gem pony was once a rare marker of crystal kingdom royalty, only shared with the populace with great sorcery and a holiday ritual. When the kingdom collapsed, undone by war with less cooperative neighbors and internal strife from those who sought greater power, the trait vanished entirely for over a hundred years. Most scholars agree that to be born with the gem-like fur coat is a sign of destiny, as sure as any brand, towards greatness and overwhelming purpose. Their kingdom may be gone, but the radiance of their hearts lives on through their descendants to cast light in the darkest of places. Resolute: You have advantage on saving throws against being frightened. Eternal Hope: When you roll a 1 on the d20 for an attack roll, ability check, or saving throw, you can reroll the die and must use the new roll. Your tribe comes into its height along with the empire. With pelts that matches the sun-baked sands, the ponies of the sun are wealthy and powerful. Able to withstand the full attention of the beloved, but cruel, sun, they manage trade lanes in places other ponies would perish trying. Sun ponies come in different breeds. Though many are built tough and earth-bound, there are winged and horned family lines. They are recognized by their chiseled features, high tail, concave profile and arched necks. As a society, they are shrewd when it comes to business. Others see them as eager to share a drink, but more so to seal a deal, and so stay careful around sun ponies. Their easy smiles hide their cunning intent. They are a welcome addition to the empire, largely following its laws and are kind to travelers. Their laws of hospitality forbid turning away a pony suffering from the sun’s unrelenting gaze, which makes ponies visiting a sun pony city feel welcome, even if the locals are already planning how to relieve them of their coin. Sun Kissed: You have resistance to fire damage. Children of the Desert: You are proficient in the Survival skill. Among the most commonly represented spiritual path, this path is expressed through a personal specialty, their brand of destiny is literally a reflection of this. Ability Score Increase: Choose one of your abilities to increase by 1. You cannot increase an ability that your sub-race has already increased. Unique Specialty: You gain advantage on checks with a single skill or tool that is tied to the brand of destiny on your flank. To represent the truly varied nature of ponykind, it was necessary to represent them with both sub-races and spiritual paths. In an effort to cut down on confusion, please read the following example of character creation specific to ponykind. This specific example does not apply to races that are not considered to be true ponies, such as purrsians, griffons, or flutterponies (who, despite their name, are not as varied as their pony cousins). Each of the following steps includes an example of that step, with a player named Rebecca building her unicorn pony character, Cluttermane. Although this example presumes that you pick Pony as your race, it is important to reiterate that there are other racial options available. Pony is the race with the most options available, but do not be deterred from playing a phoenix wolf or sun cat if you so wish. If you do not choose a pony, skip to step 4. Rebecca already has a strong character idea in mind, and would like to create a unicorn pony researcher. She notes the default pony statistics on her character sheet, and looks up what it means to be a unicorn pony. A relatively standard character option is the sub-race. Not all races get a sub-race choice, and most of the other races in this book will not have such an option, but ponies receive a generous range of such sub-races. Though you may already have a sub-race in mind for your character option, feel free to read over the other sub-race options, as some are unique to the setting of Everglow. Already decided, Rebecca notes the unicorn sub-racial traits on her character sheet. However, Rebecca hasn’t given thought to Cluttermane’s spiritual path, and she begins to read into those options. 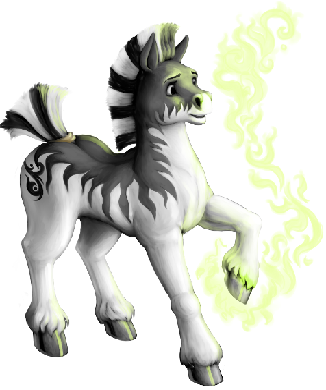 A spiritual path is an important and specific choice that sets ponykind apart from most of the other races. It represents the plethora of destinies that are woven together as ponies make their way in Everglow. While most ponies simply choose the unique destiny, the other options can help differentiate your character. Choose carefully when deciding your spiritual path, as it can affect the story of your pony more profoundly than even their race or sub-race! Although she found the other spiritual paths interesting, Rebecca’s vision for Cluttermane was solid; she wanted for him to have a unique destiny as a disorganized but brilliant researcher. She chooses the Unique Destiny spiritual path, and applies it to Cluttermane’s History skill, representing his ability to delve into historical matters and search through places of antiquity.